Cascade's panel is a national network of pre–screened, highly professional clinicians who provide the highest quality clinical services to employees and their dependents. We administer a comprehensive admission process before we invite a clinician to join our panel and we monitor provider performance. The excellence of our service is assured by selecting the most experienced counselors for our panel and by ongoing quality assurance procedures. Our diverse network included all necessary clinical specialties. Cascade Centers is excited to announce our new online provider portal ProviderAdvantage . 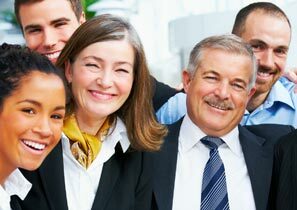 ProviderAdvantage will enable our providers to manage administration functions more efficiently and conveniently. 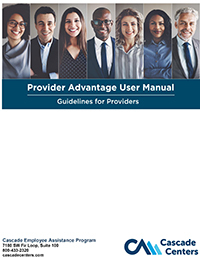 ProviderAdvantage provides increased convenience for our providers and decreased time spent on administrative tasks. ProviderAdvantage is available 24 hours a day, seven days a week (24/7). It is completely secure and is built with multiple layers of network security. Our system employs 128–bit secure socket layer encryption for all communications between the provider's computer and the portal. We also encrypt sensitive data that is stored in the database with 256–Bit AES (Advance Encryption Standard). If you have any questions please call our toll–free number, 800–433–2320, or email us at info@cascadecenters.com.